Murasaki Shikibu's eleventh-century novel, Genji monogatari (源氏物語) -- The Tale of Genji --, is, of course, the Japanese classic. On any shortlist of canonical world-literature texts, the obvious foundational text of Japanese literature, and of similar national importance as, say, Shakespeare is to English literature, or Goethe to the German. Except that, as Michael Emmerich argues in his slightly confusingly identically titled study, the path that has led to its current prëeminent rank wasn't nearly as obvious or as straightforward as it now might seem. Genji monogatari [as I will refer to the text from now on, to differentiate it from the title of Emmerich's book] always had a place in Japanese literature, and it continued to be read and studied, but until relatively recently its reputation and significance were nowhere near the level they are now (in part also because no one seems to have thought about literary texts that way in Japan until more recent times). is not really being "received" all that much even in Japan. Vastly more important than "the text" and its reception are its replacements: translations [...] that are read instead of the (unknown and unknowable) original. Emmerich's study is of these 'replacements' -- specifically the ones that most shaped what and how we now think of Genji monogatari. It's a fascinating idea, and Emmerich's detailed examination a convincing one -- and a useful starting point in considering other canonical texts, too. While there are broader implications to Emmerich's thesis, Genji monogatari is also an ideal text to work with; few other works ( the Bible ? the Arabian Nights ?) have so obviously been defined by their replacement-texts and (in the broadest sense of the word) translations. The Tale of Genji is divided into two basic parts. In the first Emmerich focuses on a gōkan version of the Genji monogatari-story, Ryūtei Tanehiko's Inaka Genji (田舎源氏), with illustrations by Utagawa Kunisada, published between 1829 and 1842. Immensely popular, each installment is estimated to have sold from ten to more than fifeen thousand copies -- staggering numbers for that time. 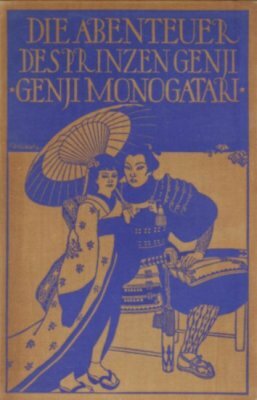 Its full title is 'A Fraudulent Murasaki's Bumpkin Genji' and, as that suggests, Inaka Genji is not so much a modern translation as it is a work that is loosely based on Genji monogatari. Inaka Genji is also not simply a literary work: as Emmerich explains, it is one of the highpoints of gōkan art (perhaps: "the highest realization of the form's potential") -- books in which illustration and text were combined in a way that went considerably beyond conventional illustrated-texts, approaching in part modern comics-style. Significantly, too, gōkan books were written: "almost exclusively in the syllabary known as hiragana -- the core of basic literacy", rather than the Chinese characters of the Genji monogatari. [Hiragana (and the similar katakana, generally used for the transcription of foreign words) resembles the alphabet, and with its 48 characters (plus easily understood functional/diacritical-mark variations) hiragana allows any word to be, essentially 'spelled out'; hence it is much easier to read than texts that involve kanji (based on the Chinese characters), of which there are thousands -- indeed, it is not unusual for at least some kanji in texts to be glossed with hiragana for easier understanding.] Gōkan were thus accessible to a much broader reading public than conventional texts -- and Inaka Genji thus was able to reach a far greater audience than Genji monogatari ('readable' at that time by only a small, well-educated group of readers). Emmerich sees Inaka Genji as the first great Genji monogatari-replacement text, even as it also brought attention back to the older work. Ironically, Inaka Genji was then itself also replaced (and hardly figures at all anymore in the contemporary reading (and veneration) of Genji monogatari). In its new guise as a typeset book, however, the Inaka Genji had become less an elegant, sophisticated, and material replacement than a textual rewriting of Genji monogatari that no longer functioned very well as a replacement because it no longer possessed the qualities that originally had made it so attractive and entertaining as a gōkan. With typesetting the text-proper became the focus, and the 'replacements' that followed were more literal translations of Genji monogatari, in Japanese but also English (and other languages), and this is the focus of the second part of Emmerich's study. Here he shows -- quite convincingly -- how Genji monogatari became the acknowledged masterpiece it now is. What's particularly interesting here is how, at the end of the nineteenth century it was still little-read and not (in any meaningful sense) well-known -- and how Western attitudes and opinions helped shape the Japanese embrace of the work. I don't think Genji monogatari itself is all that great a work. [...] No one would praise Genji monogatari if you wrote it today. Emmerich notes the (perceived) significance of Arthur Waley's six-volume translation of Genji monogatari into English (1925-33) in helping to establish the present-day reputation of the work but does well to reinforce his thesis by showing just how significant an earlier (but now almost entirely overlooked) replacement-text was, Suematsu Kenchō's 1882 translation into English. While the distribution numbers -- 500 copies printed, 242 sold and 78 distributed for free in the first decade after its publication date -- suggest it didn't get very far, Emmerich's detective-work shows it had an enormous impact. The continuing presence of Waley in this endless whirl of discourse, and the almost total erasure of Suematsu, indicates once again that when we talk about Genji, we are always calling on certain images of the tale and excluding others. Emmerich dates the first Genji-boom in Japan itself to 1890 (leaving aside the earlier, slightly different 'Inaka Genji-craze'), a time when the first translations (and relatively affordable ones, to boot) into modern Japanese of the text itself became available. But the Genji monogatari-as-we(and especially the Japanese)-now-know-it really only finally crystallized in Tanizaki Jun'ichirō's translation into modern Japanese -- Tanizaki being one of the two writers Akutagawa cited as having actually read the book. (Though, in fact, there were actually three Tanizaki-translations.) Emmerich does not continue his story much beyond the Second World War, with only glancing mention of other translations, both in Japanese and English (Seidensticker (1976); Tyler (2001)), which is a bit of a shame -- the replacement-idea is a fascinating one and obviously can be played out to the present day (albeit with much less clear replacement and more overlap than in the period that is Emmerich's focus). The Tale of Genji is a fascinating study, and a useful starting point to discussions of canonization, world literature, and translation (in its narrow and broader senses). Emmerich's basic thesis is a useful one, and his arguments well-supported, making also for a fascinating historical study. Yes, the focus is Genji monogatari, but Emmerich uses Genji monogatari as a case-study, and much here applies more braodly. That said, the case-study is a detailed one, and so interest in Genji monogatari (and Japanese literature in general) helps; it is rather a lot for anyone who has no interest in that book or Japanese culture. The German translation is notable for its cover, which may well be the ugliest and most disturbing artwork ever created on a Genji theme. You can't be saying stuff like that and then keep readers in the dark ! Emmerich is definitely onto something here, and The Tale of Genji should be the basis for much further discussion and study. As his concluding chapter, 'Turning to Translation, Returning to Translation' also documents, however, there have been many false and fitful starts in approaching literature from these angles, and discussion hasn't really gotten going. So too the limited response so far to this book -- I couldn't find a single review of it, though no doubt some will be forthcoming in specialist journals (and the Japanese will obviously have to react) -- does not bode well. One hopes that eventually people catch on: this is a very fine study, and it is an important book that could and should be a stepping-stone in literary studies (before the replacement-texts come ...). Michael Emmerich, born in 1975, has translated numerous works from the Japanese. He teaches at UCLA.